Image Left to Right: Elizabeth Gilfilen, Underscore #2 (2018), Oil on canvas, 20"x16"; Molly Herman, Looming (2018), Oil on linen, 58" x 48"
Equity Gallery is pleased to present Cadences, a show curated by Michael Gormley and featuring the work of Elizabeth Gilfilen and Molly Herman. Beyond the two painters displaying similar stylistic approaches, reflecting pronounced abstract expressionist influences, there is another striking thematic thread between the artists’ respective bodies of work. 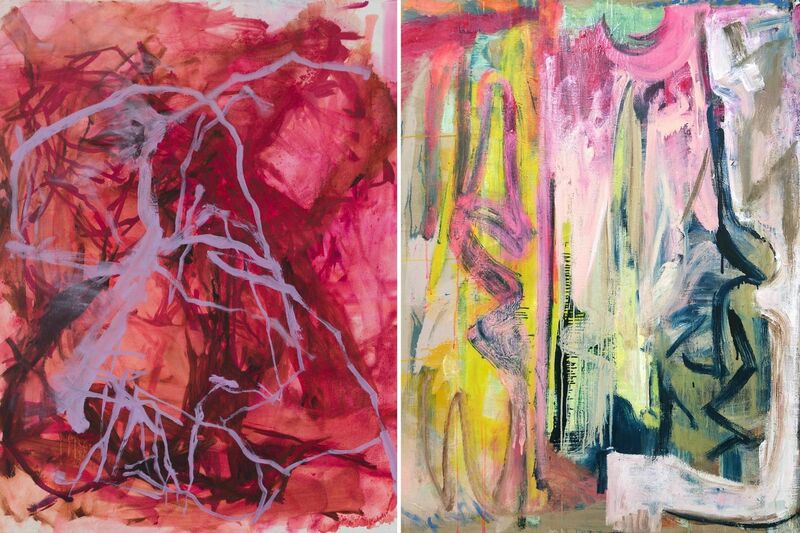 The paintings of Gilfilen and Herman both explore the power and dynamics of overlapping paint and abstracted forms, as well as examining how the size of the work can alter and contribute to the manifestation and impact of this concept. Gilfilen combines expansive, smeared-on amorphous swaths of diffused, translucent oil paint with well-defined spindly lines to achieve a sense of barely contained turbulence. In a process she likens to drawing, Gilfilen incrementally spreads a series of thin, fluid layers of paint onto the canvas. The frenetic streaky marks gradually build up to form an undulating, billowing mass. Upon this foundation, she then incorporates radiating tendrils, which appear to wrap around, tighten, and restrict the already tumultuous aggregation of paint strokes. The tension rises with each added accumulated layer. Lines, erratic imprints, and splotches of pigment aggressively entangle, dip, and collide into each other in physical conflict. As they constrict and struggle against each other, the paintings give off a sense of infinitely building force, perpetually on the precipice of an explosive release. Gilfilen uses the scale of her canvases and paper to heighten this sensation further. By leaving uneven white negative space around the edges and borders, the formless collection of paint appears to still be in the process of rapid, expansive growth. The canvas itself is framed as a constraining force, something barely holding back an ever increasing energy. With her larger paintings, this visual experience has an immediate overwhelming quality. In smaller works, it is presented as more subtly disquieting, a process that has only begun to germinate. Similarly, Herman overlays discordant colors, shapes, and textures within her artworks. She layers paint and implements materials in a way that emphasizes roughness. Her handling of paint makes each brushstroke heavily tactile, possessing a tangible, full-bodied quality that can range from dry and chalky to slick and juicy. Some of Herman’s work also utilizes rugged found surfaces, such as burlap to further this aesthetic. As she layers her brushstrokes, structures, and media, the craggy, uneven surfaces peer out from under each other. No layer is ever fully obscured. In addition to this, she combines and contrasts geometric shapes, often implementing harsh angles and curves within her paintings’ compositions. Despite these seemingly disparate components, instead of chaos, Herman’s handling of the gradual layering allows these components to meld together naturally. Palettes that would typically clash become subsumed into each other, creating an entirely new muted earthy tone through their union, all while original colors still remain partially present. The severe shapes nestle into one another, intermeshing and fortifying each other. Herman uses layering and overlap to create structure and harmonize “incompatible” parts within her work, reminiscent of a musical arrangement, stained glass window, or the patterns in patchwork quilts. Scale is used to turn these paintings into formidable composition or to make smaller works appear more imposing. Herman makes sure that all the painterly gestures and rhythmic interactions of the forms within the piece are focused and kept self-contained within the canvas. Every inch of the surface is filled with color and texture. The rich, density of paint, as well as how the wide variety of eclectic forms synchronize with each other, amplifies the size, solidity, motion, and gravitas of each work of art. Through layering, juxtaposition of contrasting forms and colors, the abstractions of Gilfilen and Herman are imbued with vigor and magnitude. But, like nature itself, this grand tumult comes together to create a sense of form derived from a higher vision. Cadences will be on view from October 17th- December 1st at Equity Gallery. Elizabeth Gilfilen is an artist based in Brooklyn, New York. She received her BFA in Drawing and Painting from D.A.A.P. at the University of Cincinnati and her MFA in Painting & Printmaking from Virginia Commonwealth University. She has been awarded fellowships from Yaddo, Robert Blackburn Printmaking Workshop, The Marie Walsh Sharpe Foundation Space Program, Gallery Aferro, Alijra Emerge, and The Bronx Museum of Art AIM Program. Her work has been featured in solo exhibitions at Reynolds Gallery, Richmond, VA; Fred Giampietro Gallery, New Haven, CT; the Hunterdon Art Museum, Clinton, NJ; Gallery Aferro, Newark, NJ; and John Davis Gallery, Hudson, NY. Her work has been included in numerous group exhibitions nationally including the Aldrich Contemporary Art Museum, the Hunterdon Art Museum, the Islip Art Museum, Lehman College Gallery, Morgan Lehman Gallery, Kathryn Markel Gallery, Reynolds Gallery, the Elizabeth Foundation for the Arts, and internationally at TW FineArt in Brisbane, Australia; among others. Her work has been reviewed in many publications including Two Coats of Paint, New American Paintings, The Boston Globe, The Newark Star-Ledger and The New York Times. Molly Herman received her BFA in Painting & Printmaking from Virginia Commonwealth University. She studied art history and archeology independently in France and Spain, returning to the United States to pursue an MFA in Visual Art from the School of Visual Arts in Manhattan, where she studied under Joan Snyder, Brenda Goodman, and Jake Berthot. Herman the recipient of a Boynton Fellowship Grant and The Paula Rhodes Memorial Award. She attended Vermont Studio Center on Scholarship, as well as the Holland Tunnel Artist Residency in Paros, Greece and participated in the Stephen Pace House Residency in Stonington, ME. She has exhibited with John Davis Gallery, Hudson, NY; Dolby Chadwick Gallery , San Francisco, CA; and Sherry Leedy Contemporary, Kansas City, Mo. Her work has been exhibited abroad with Holland Tunnel in Paros, Greece, in Matter Italy, via curator: Pino Nicoletti and St. Chamas, France with Dusk editions. She is currently represented by Amy Simon Fine Art, Westport, CT; Sideshow Gallery, Brooklyn, New York; and Carrie Coleman Fine Art, Norfolk, VA. Additionally, Herman is a new member of The Painting Center in Chelsea, NY. Her studio is located in the historic Leviton Lighting Factory in Brooklyn, NY.